Successful communication requires cultural competence. How to bridge cultural gaps and increase your own cultural sensitivity? Bridging cultural gaps requires intercultural competences, such as the ability to recognise and acknowledge cultural differences. It also involves developing intercultural communication abilities and using these to adequately manage intercultural situations and interactions. Recognition starts with knowing one's own culture and values and respecting others. Respect in itself is culturally determined. Uniting, bridging gaps, reconciliation and acknowledging require two-way processes. If it has never left its pond? If he is prisoner of his doctrine? A useful tool for understanding differences in cultures across the world is the one developed by Prof. Geert Hofstede (see www.geert-hofstede.com). He is one of the most cited authors regarding the world-wide classification of cultures. Hofstede defines culture as the "collective mental programming of the mind which distinguishes one group or category of people from another". His classifications give insight in the average pattern of beliefs and values of a culture. Short term and long-term orientation. There seems to be a correlation between the different dimensions, in such a way that collectivistic cultures tend to value large power differences and focus on uncertainty avoidance. Hofstede´s classification offers a valuable tool for recognising and understanding the behaviour of groups and translating the information thus obtained to water management. Institutional aspects: staff, capacities, working relationships, power relationships. 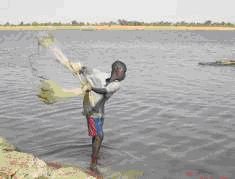 These, however, are not enough to guarantee the sustainable and participatory management of these resources. 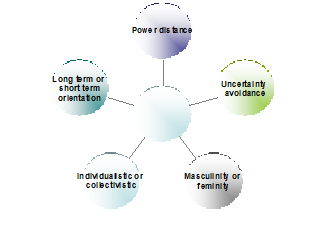 One should be aware of Hofstede's 5 classifications with regard to his actions. For instance, if there are plans involving a change in the water board or its members, one should be aware that the decision making is collectivistic by nature, that the power distance is an issue in this society, especially when it concerns in-group/ out-group boundaries (2 tribes). And thirdly, that the society as such does favour women becoming active members as long as this is not threatening to the other aspects (power, uncertainty avoidance, collectivistic focus, etc. ).